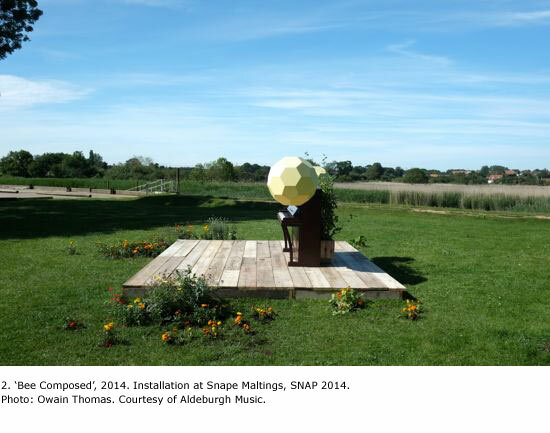 Lily Hunter Green is a sound installation artist and contemporary composer who lives and works between Brighton and Suffolk. Born 1990 in Melbourne, Australia, she is a recent graduate in Contemporary Music and Arts from the University of Brighton. Her work has been exhibited in the Brighton Dome as part of the Brighton International Festival (2012) and in the SNAP HQ at Snape Maltings in Suffolk as part of the Aldeburgh Poetry Festival 2013. Her composition 'Decomposed' was featured on BBC Radio 3's 'Private Passions' as part of Maggi Hambling's personal selection in November 2013. 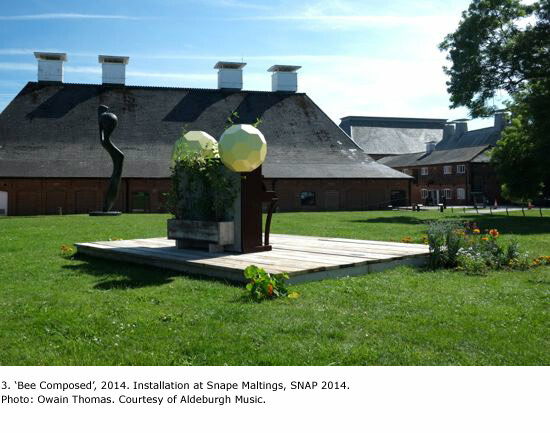 Bee Composed will be located on the Henry Moore Lawn at Snape Maltings for the duration of SNAP 2014. 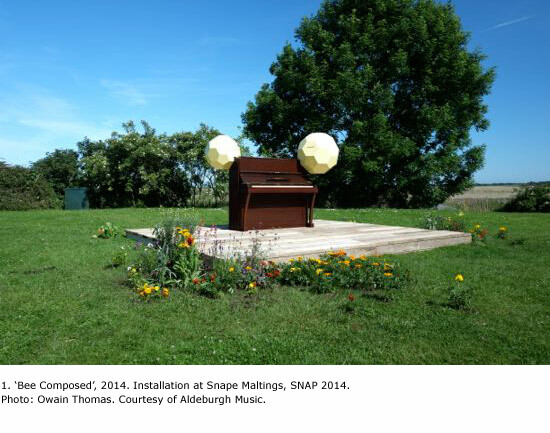 It is an audio-visual art installation comprised of an upright piano, which has two beehive-like structures emerging from its top corners. The piano, which will sit on a wooden plinth, no longer functions as a conventional working instrument. 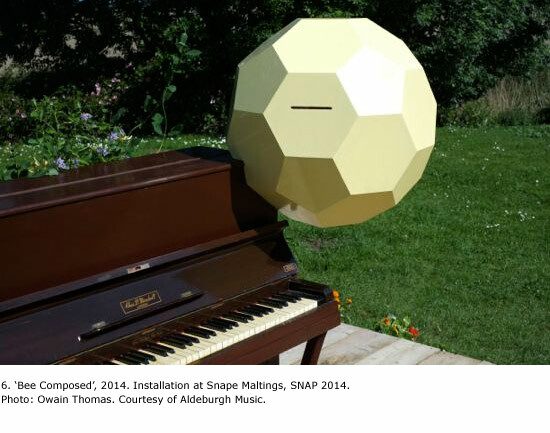 However as the public approach, a sensor will activate buzzing, humming… sounds and chords from within the piano body. Pre-recorded film footage will simulate the activity of bees in an active hive. 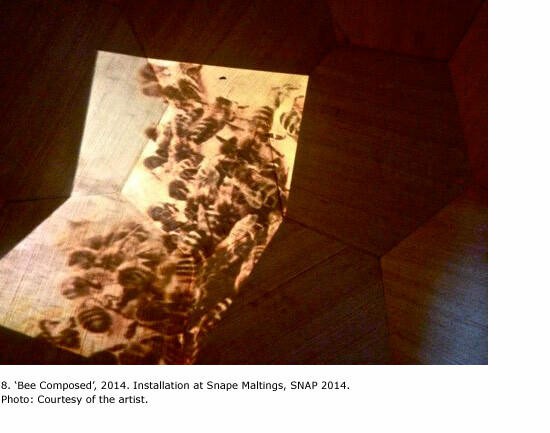 This will be projected within the hive-like structures and be visible by looking through small holes cut into their shape. The footage will be taken directly from a second piano, located close by but not accessible to visitors. 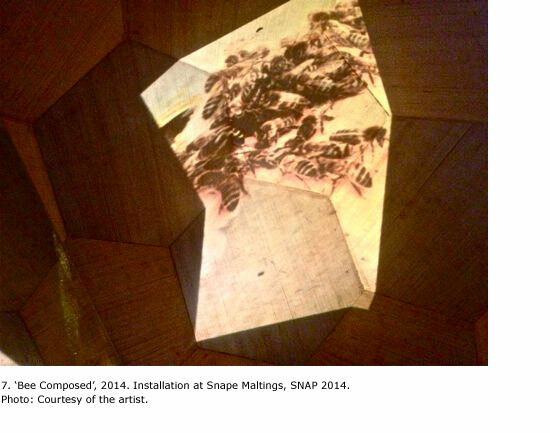 The artist will have established this concurrently as a working and active beehive. 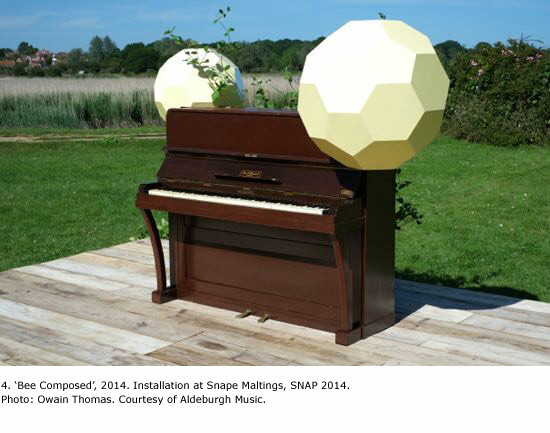 As the real life ‘piano hive’ evolves throughout the installation period, new footage will be relayed to the installation on the Moore Lawn. 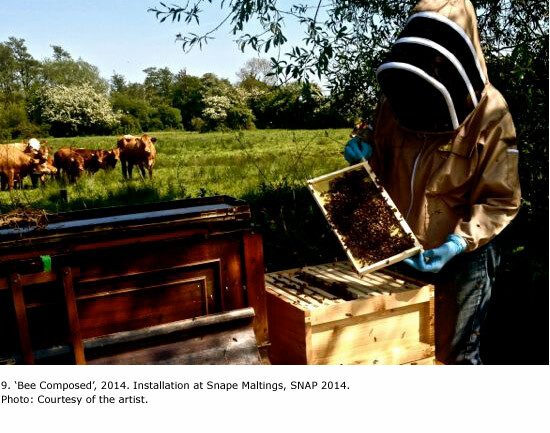 To accompany the filmed activity of the bees, the artist will compose audio works that will also evolve throughout the SNAP exhibition. 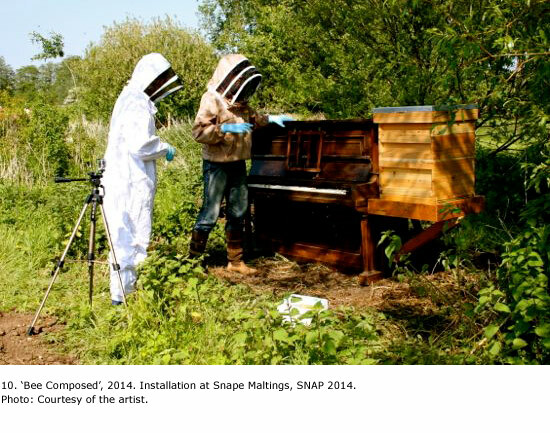 These works will comprise of piano compositions, both combined with and inspired by the sounds that bees make. Several headphone sets will be attached to the piano body on the Moore Lawn through which these will be played. 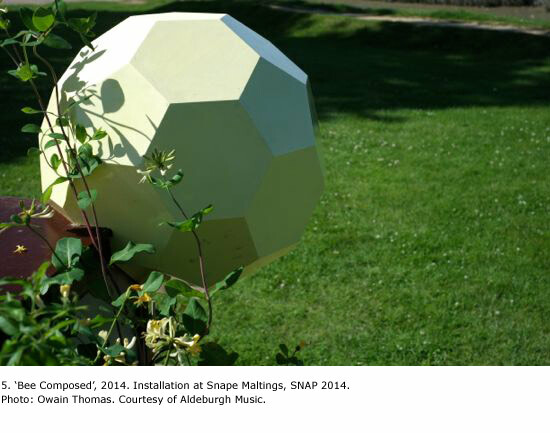 The uncertain behavior of the bees will create an evolving dynamic to which the artist will respond throughout the exhibition period. Like performance, although a scene will be set, the nature of this project is progressive with an uncertain outcome. “The bees will have direct access into the body of the 2nd piano and are likely to interact with the soundboard and strings. I’m intrigued at this stage about the sounds the bees will make as a collective in the acoustics of the piano. The piano already resonates massively when I put it outside in the wind. With a collection of hums and vibrations it should create something quite unique. Lily Hunter Green April 2014.